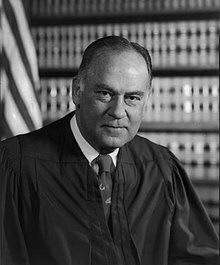 Potter Stewart (January 23, 1915–December 7, 1985) was an Associate Justice of the Supreme Court of the United States. The Fourth Amendment and the personal rights it secures have a long history. At the very core stands the right of a man to retreat into his own home and there be free from unreasonable governmental intrusion. Silverman v. United States, 365 U.S. 511 (1961). I think that the court has misapplied a great constitutional principle. I cannot see how 'official religion' is established by letting those who want to say a prayer say it. On the contrary, I think that to deny the wish of these school children to join in reciting this prayer is to deny them the opportunity of sharing in the spiritual heritage of the nation. Dissenting, Engel v. Vitale, 370 U.S. 421 (1962). Concurring, Jacobellis v. Ohio, 378 U.S. 184 (1964). Dissenting, United States v. Ginzburg, 383 U.S. 463 (1965). In the governmental structure created by our Constitution, the Executive is endowed with enormous power in the two related areas of national defense and international relations. This power, largely unchecked by the Legislative  and Judicial  branches, has been pressed to the very hilt since the advent of the nuclear missile age. For better or for worse, the simple fact is that a President of the United States possesses vastly greater constitutional independence in these two vital areas of power than does, say, a prime minister of a country with a parliamentary form of government. In the absence of the governmental checks and balances present in other areas of our national life, the only effective restraint upon executive policy and power in the areas of national defense and international affairs may lie in an enlightened citizenry — in an informed and critical public opinion which alone can here protect the values of democratic government. For this reason, it is perhaps here that a press that is alert, aware, and free most vitally serves the basic purpose of the First Amendment. For, without an informed and free press, there cannot be an enlightened people. Potter Stewart, (New York Times Company v. United States, 1971). Concurring, Roe v. Wade, 410 U.S. 113, 169-170 (1973). This page was last edited on 8 April 2018, at 11:17.